Corruption cases against Gotabaya Rajapaksa currently in court considerably dampen enthusiasm over his recent tirade against public sector corruption. Gotabaya, who is widely expected to run for President, speaking at a Viyathmaga event last Sunday (14th) underlined pubic sector corruption as one of the factors that need urgent attention. He was unveiling his ‘Vision 2030’ which is essentially a policy statement of Viyathmaga, an organization many believe was put together to promote Rajapaksa’s probable candidacy. a) As the Chief Accounting Officer of the Defence Ministry, did he not know that there was a US $ 7 million difference between the Government of Sri Lanka’s payment to Bellimissa Holdings (a non existent company) said to be in UK and Bellimissa Holdings’ payment to Ukrinmarsh, the Ukraine government arm that sold the MiGs? b) What happened to the file connected with this purchase which was in the custody of the Sri Lanka Air Force that has since gone missing? c) Why is he not facing Court to answer these charges but resorting to delaying tactics ? The Rajapaksa Government has commenced a campaign to threaten and intimidate Sri Lankan academic Dr. Thrishantha Nanayakkara who exposed for the first time the tender procedure about the controversial MiG 27 purchase by the Defence Ministry in an article he wrote in the Colombo Telegraph recently. Dr. Nanayakkara’s family in Sri Lanka have been visited by military intelligence officials who have urged him to stop writing, the Colombo Telegraph learns. He has since de-activated his Facebook account. Repeated attempts made by Colombo Telegraph to reach Dr. Nanayakkara have proved futile. Dr. Nanayakkara is a Senior Lecturer at the King’s College London, where he is attached to the Centre for Robotics Research. As an ex-academic at the University of Moratuwa, Dr. Nanayakkara has served on the technical evaluation committees at the Defence Ministry run by President Rajapaksa’s brother Gotabaya Rajapaksa. The controversial MiG 27 deal was first revealed by Sunday Times Defence Correspondent and Senior Journalist Iqbal Athas in December 2006 and further exposed in The Sunday Leader then edited by murdered Editor Lasantha Wickrematunge. Defence Secretary Gotabhaya Rajapaksa filed legal action against The Sunday Leader newspaper to prevent further exposure of the corrupt deal. The investigative reports on the MiG deal proved to be one of the last reports on controversial defence purchases under Gotabhaya Rajapaksa’s reign in Sri Lanka’s mainstream press. 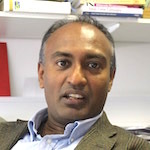 In a recent article published in the Colombo Telegraph, Dr. Nanayakkara claimed that the Ministry of Defence calls on academics to sit on Technical Evaluation Committees for defence purchases, gives them less than 24 hours to review documentation and then finally blames academics when things begin to go wrong. In his latest article, Dr. Nanayakkara notes that it was very unfortunate that the Ministry of Defence itself took to exposing the names of professionals and the recommendations of those TECs when things went wrong. “It seemed to us that the professionals who were kept in the darkness whole throughout the TEC process were just used as a cleansing shield in the event things go wrong. I am not alone in this concern. One can check with any academic in the University system in Sri Lanka on this,” he explains. Responding to the fraud said to have taken place when purchasing MIG 27 fighters for Sri Lanka Air Force, the Ministry of Defence exposed the names of the Technical Evaluation Committee. Would Sri Lanka Elect A Tamil Or Muslim President?